The Christian life is remarkably easy to describe. 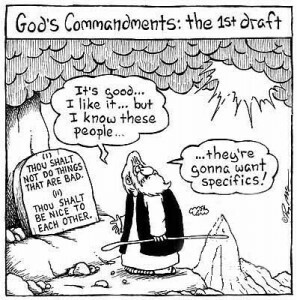 Oh, you may not think that; it seems like those lousy Christians (or if you’re a Christian, those lousy preachers) are always talking about all the commandments we have to follow to be “holy.” Sometimes they’ll even throw out numbers (usually 613) that are somewhat hard to delineate, but are nonetheless impressive. And of course we all know the 10 commandments, even though actual stats show that less than 14% of Americans know the 10 commandments, whereas 25% know all the ingredients of a Big Mac and 35% could name all the Brady kids. Apparently television outranks the Bible and food in importance. Even in the bad ole mean Old Testament, God was still all about love. In Numbers, God clarifies that all sin against other people is really sin against God. Why, you ask? Because we are created in the image of God. To attack God’s image is to attack God himself. When the world is dividing itself into “us” and “them,” when the “innocent” are hurt by the “powerful,” when the “bad” is hurt by the “good,” we are all still answerable to God himself. We are kind to others, not because they deserve it, but because God deserves it. Think about the last 24 hours. Did you speak to everyone as if you were speaking to God? Do you react to everyone as if you were reacting to God? Did you give respect to everyone as you would to God? Can you say honestly say that you loved God, and that you loved others? If not (and let’s go out on a limb and say that none of us did that), then that is the challenge for today. Speak to that friend, or parent, or boss, as if you were talking to God. Treat that homeless person as if God was asking for help. Give as if you were giving to God. Obey that authority as if it were God himself commanding you. Because in many ways, it is. Have you ever considered the emphasis we place on efficiency in our culture? We constantly strive to do more, do it faster, and add even more. One of the fastest selling categories of books in recent years has been pre-prepared meals. If you’re unfamiliar, this is the methodology of cooking all your meals for the week on one day, and then freezing them (or preserving them some other way), and then they’re ready to go at a moment’s notice. Not a bad deal; but have you ever asked yourself “why”? Why is it so important to get through our mealtimes as quickly as possible? Back in the day, families would spend hours getting meals ready, and hours sitting down to enjoy them. In some areas of the world today, mealtimes are still considered more social activity than refueling station. But not here. The only exception might be “going out,” which it seems we allow ourselves the luxury of sitting around in a somewhat leisurely fashion. It’s not all bad, of course, unless you’re reheating McDonalds. That’s just wrong. But other than that, families are pressed for time these days, and sometimes we don’t have time to let then fatted calf roast slowly over the open fire. Yet the emphasis on efficiency sometimes seeps over into our spiritual life, and in that case, it’s rarely a good thing. We want to do our devotions in 2 minutes. We spend 30 seconds in prayer. We want the pastor to finish preaching precisely at noon, or face the sea of grumpy faces. Several times in the Bible, it seems that God is deliberately forcing people to be inefficient. Look at today’s verse: God specifically tells the Israelites not to harvest to the edges of their field, and to intentionally be careless with harvesting. The argument usually goes that this was the Israelite version of welfare – poor people could come and harvest the leftovers. But why not just say “take 10% of your harvest and give it to the poor”? Why deliberately leave it in the field? What if no poor people come? Your crop is wasted. Here’s the deal – it’s not “your” crop in the first place. The whole thing belongs to God. Your job, your family, your time, does not belong to you. It belongs to God. That’s what making Him “Lord” means. Sometimes we think we’re doing God a favor by tithing, or doing devotions, or praying. In reality, everything we have/do/are belongs to Him, and He gives us freedom to enjoy them. And as Lord, what does He desire? Obviously it’s hard to speak for God, but what did God do with Adam? Did he command him to worship Him? Did He say “name these animals, and get a jump on it”? The Bible says that God came to walk and talk with Adam in the cool of the evening. We were created for fellowship; we were created to hang out with the Creator of the universe. And we choose to rush through that so we don’t miss a few minutes of television? Seems kind of strange, don’t you think? Maybe today we should take the time to be deliberately inefficient. Maybe in our effort to squeeze every penny and every second out of our day, we miss what we were created for. Take the long way to work, and spend that time talking to God in the car. Take the time to slowcook a meal, and spend that time talking to your family about your day (and hopefully squeeze some Bible in there). Take a walk and just ramble, and wait for God to speak. Perhaps He’s just waiting for a chance.